An everyday fitness watch for £120 - too good to be true? The Asus VivoWatch seems to be the perfect combination of smartwatch and fitness tracker, decent specs and low $150 price, useful screen and great ten day battery life. At first glance, it's a fitness focused Pebble rival that's iOS and Android compatible but dig deeper and Asus is really looking for a share of Fitbit, Jawbone and Garmin's success. Can this activity and sleep tracking, heart rate monitoring bargain smartwatch become your everyday fitness and wellbeing wearable? If you were expecting a ZenWatch lookalike, you're half right. The VivoWatch actually most closely resembles a Pebble Time - both have that retro chic look about them with squircle builds. The VivoWatch is smaller than the ZenWatch with quite big bezels around the small screen, an unfortunately prominent Asus logo and a chunky body. But it still has stainless steel around the edge, the lugs attaching the swappable band are small and tidy and it's a fairly comfortable fit. We say fairly because the body curved on top but not on the inside which is a shame - it makes a difference. As with most smartwatches, compared to fitness bands, you will feel as you move your wrist around - jogging, for instance. So in terms of design and fit it's a mixed bag. It's smart enough to wear to work if you can pull off a bit of retro chic and small and light enough (at 50g) for both women and men to wear. It's a truly everyday wearable, water resistant to IP67, that doesn't feel like a constant reminder to keep moving like say a Jawbone UP3 does but perhaps will work best for those looking to be more active without proclaiming it to the world. The VivoWatch is and isn't a smartwatch. It looks like any other smartwatch like a Pebble or Sony SmartWatch 3. It displays the time and date digitally and it vibrates when you get a phone call. But that really is it. No WhatsApps, Facebook messages or tweets - it doesn't even vibrate when you get a message. There's also no third party app support beyond notifications. One big plus - it sounds simple but it's worth a mention because even the Apple Watch hasn't cracked it - the VivoWatch displays the time, date and battery life all the time not just when you raise your wrist. That means no blank screen on your wrist. So while it's cheaper than the Fitbit Surge and Garmin Vivoactive, both fitness devices with screens, it's also less capable as a smartwatch as well as being less capable as an all-round tracker. If you're looking for a smartwatch at this price, Pebble Time is your watch, if you're looking for a tracker but don't care about alerts you might be better off with a Jawbone UP2 or Fitbit Charge HR. That said, while Asus doesn't have the community and ecosystem of fitness specialists such as Garmin, Jawbone and Fitbit, the VivoWatch is a solid little tracker. The OS is very basic - swipe left and right from the watchface screen to view and set alarms, take your pulse via an optical heart rate monitor, check the UV index and glance at daily steps and calories. Swipe up for exercise duration, sleep duration and Asus' Happiness Index score out of 100 - more on that later. If you're sitting down for too long, the VivoWatch will buzz you to get up and move around and there's a trophy screen and vibration when you hit a daily goal. Steps and calories are tracked automatically and both have been on a par with Jawbone's count and reliably matched up to my activities throughout the week. Pressing down on the unlock button on the right hand edge of the VivoWatch activates exercise mode. Now, this is only really designed for runners, there's no option to specify activities - you can view a stopwatch and all the above metrics including heart rate throughout your run with the exception of distance which is a big omission. There's no GPS but it doesn't even work with your smartphone to estimate the distance. What is nice is that a blinking LED just below the display - which will also stay green is UV levels are high and you should get out of the sun - will blink green while you remain in an aerobic heart rate zone. Push yourself too hard and it will turn red - it's a really handy visual cue to glance at rather than making your brain compute the bpm numbers onscreen. The heart rate tracking itself was broadly accurate but slightly lower than we got from a chest strap when we were out running so that's something to keep an eye on. The heart rate tracking is continuous with daily averages and maximum rates. It even continues to read your pulse throughout the night - much more useful than the once daily resting rates taken by Jawbone's new trackers for instance. Speaking of sleep tracking, we wore the VivoWatch in bed for a few nights - you don't have to activate it, it works automatically and we found the total times and the fascinating turns count (as in tosses and turns) tallied with our sleep experience. That said, there were a couple of times where we were sat down and the VivoWatch clocked twenty minutes of sleep, including comfort sleep. And we're certain we didn't nod off in front of Netflix. Another important point: some people are happy to wear a watch to bed but not everyone - we found the VivoWatch wasn't quite as easy to forget at night as a slim fitness band. That's a personal preference, though, so we won't mark it down for that. You'll need to download the HiVivo app from the App Store or Google Play to set up the VivoWatch and enter in your personal stats. The swipable, different sized plant graphics in the daily view of the app look pretty but aren't hugely useful in terms of motivation. They refer to the Happiness Index score which Asus awards you throughout the day based on activity, sleep and possibly UV levels. After a week of using it, it's obvious that more exercise and more sleep equals a higher score but on some days, we just couldn't fathom why we had a higher or lower score. Otherwise, it's graphs galore for daily views of total steps, total calories, heart rate and sleep stats plus weekly averages for exercise, aerobic, sleep and 'comfort sleep' i.e. deep sleep. You can of course set goals for steps and calories and there is some guidance as to goals for aerobic exercise (between 20 - 30%) and comfort sleep (between 30 - 40%). But there's no attempt at any real coaching or actionable insights or the ability to export data to other fitness apps and services. There is a network section to the HiVivo app which allows you to add friends who also have a VivoWatch, compare Happiness Index scores, give thumbs ups and send messages. It's a nice bonus but there's so many fully-fledged health and fitness communities, Asus has its work cut out for it with no extras such as food tracking or groups to join. 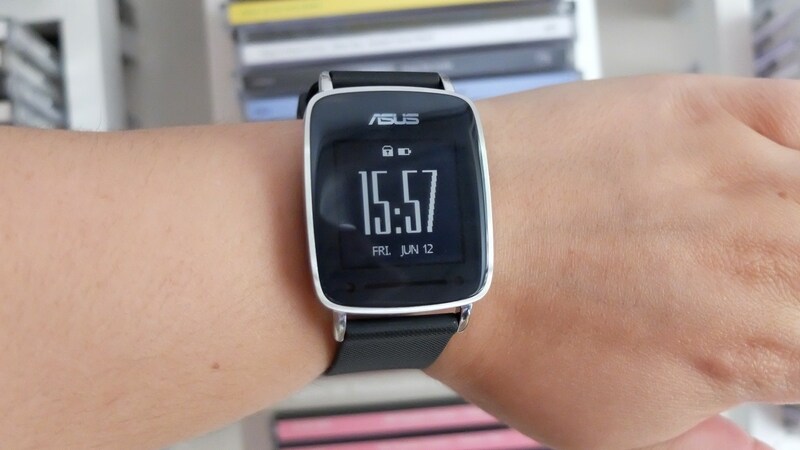 To fit in with the custom OS and focus on fitness, Asus has chosen a monochrome 128 x 128 Memory LCD for the VivoWatch. So every time the touchscreen refreshes or changes, some pixels stay the same thereby conserving power. It's not as zippy as high end Android Wear watches that cost twice the price when navigating menus, though, more like Kindle speed. Like the Pebble, though, it's really easy to see in broad daylight so there's no squinting as with Android Wear plus there is actually a backlight too. The other big result of the screen decision is a superb ten day battery life to rival the colour e-paper Pebble Time Steel's claimed stamina. We can confirm that after a week of wearing the VivoWatch we're still on the first charge and we'll update the review in the next week or so when it finally conks out. It makes such a difference not having to worry about the VivoWatch dying midway through the day. Charging is taken care of with a bundled Asus USB cradle which is a bit of a faff but no more so than fitness tracker and smartwatch rivals. The Asus VivoWatch is a funny device to score. The compact design, screen and battery life are an inspired combination that really provides something different. It's not a me-too band or a high end Android Wear watch and at this price, it works for beginners and casual runners/walkers. But what's left is a jack of all trades wearable that ends up being a solid tracker but not quite good enough to compete with the dedicated fitness bands. The app needs to be stronger with more sports and a distance metric for runners. Its smartwatch skills, bar telling the time, are almost non existent - a vibration for messages at least surely couldn't hurt. If Asus can update the VivoWatch to be more of a budget Garmin Vivoactive then we'll be talking.